The 1" diameter anodized aluminum framework is easily installed by the average homeowner. Held in place by stainless steel screws, the galvanized steel braces which support the tubing are mounted at regular intervals around the perimeter top cap of your above ground swimming pool. All "arms" of the tubing meet in the center of the pool (on a round pool) and are joined by the use of a "spider" assembly which holds them securely in their proper place. All pool dome hardware in included in the price of a sun dome. You have your choice of a vinyl cover or screen cover to spread over the assembled framework and secured in place with aluminum hooks that fasten to each upright on your pool. Tie-Downs are used to secure the cover to the hooks at regular intervals. Each unit has 1 zippered door opening. The vinyl units have either 2 or 3 screened windows for ventilation. The larger units have 3 windows and the smaller ones have 2. The screen covers do not come with windows as ventilation is readily available. 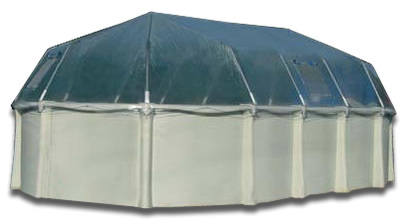 Although an above-ground pool dome cover will handle weather well, allow you to start swimming much earlier in the season, and extend the latter part of your swim season, they are not designed to support snow load or withstand extremely heavy winds. The cover can be easily removed for winter storage. Some folks remove the entire framework to allow for the placement of a full winter pool cover during the winter.